Do you think you have to pay a lot of money to get a good neutral gray reference? If so, read on. The best solution may be free, and it may come from a hardware store. I am colorblind -- not that I see things in black and white, but I have trouble seeing some reds and greens. That creates problems. It means that I need to have color references I can trust, because, if I do, I can use them to create images with pleasing, vivid and accurate colors. If my references are off, then my images will probably be too. 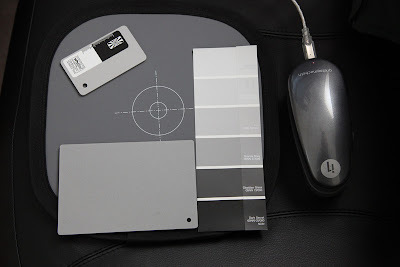 I wanted to know which of my available gray-card references was most accurate, so I decided to measure them using a Gretag Macbeth i1 Spectrophotometer that I have. The i1 isn't the world's most accurate Spectrophotometer, but it's better than what most photographers would have available. If someone wants to improve on this by providing better measurements with a higher-end tool, I'd love to hear about it. The candidates and the i1 Spectrophotometer are shown in the image below. I used the i1 to measure the "color" of all of the choices, then summarized how much they deviated from a neutral gray in the table that follows. The gray references are the Lastolite Ezybalance (largest behind the others), the WhiBal White Balance Reference (smallest with the black and white areas), DGC-100 Digital Gray Card (medium sized -- all gray) and a Glidden Paint sample strip (Snowfield, Universal Grey, Veil, Granite Grey, Obsidian Glass, Dark Secret) from Home Depot. The measurements surprised me. I would have thought that the photo-products would have outscored the paint sample, but that's not the case. 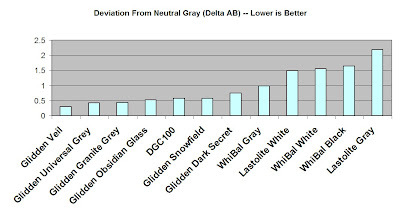 The Glidden strip is more neutral in every case except for the extremes where "Snowfield" (the lightest color) and "Dark Secret" (the darkest color) are slightly less neutral than the DGC-100. So, what's a photographer to do. Well, if you've got something that's working, stick with it. My measurements are the average of three measurements on a single product, and there may well be enough product variation that you've got "a good one." If you're looking to buy something new, you might just settle for the right Glidden paint strip in these tough economic times. I have to admit, I like the form factor of the Lastolite the best, but I've been using it less and less since I did these measurements. There is some evidence that in order to set color and white balance you are better off using a calibrated white target. A gray card is preferred to set an average exposure. The difference is that the white target will provide more data from which to measure color neutrality. This partly because the camera's imager will contain more data close to saturation, 255, 255, 255 (in 8 bit parlance. More bits equates to even more data.) More importantly is that the image will contain most of its information in the first 2 stops of highlight data. If you expose the white target at just a bit below saturation of any color channel, you will have more data to work with than a gray target and the extra data yields greater accuracy. This is especially important in white balance situations like tungston where a color channel will naturally be suppressed. Well, I don't feel so bad about forgetting to get a gray card shot; instead relying on the white cotton shirt collar of the groom. It's been working for me for some time! Ziggy53 -- I've heard that and seen some of the threads too. I suppose if the target is placed in the scene to be used later in post-processing, then it's overall reflectivity will determine how much information is available to the eye-dropper for setting white-balance in post-processing. Having said that, I still think it's more important to have a flat spectral response and equal reflection of red green and blue than have a "white" or "gray". Not surprisingly, it looks like more exposure is better, but at least for this camera (which admitedly has a lot of dynamic range), I don't see any reason to go for a higher exposure than normal. Cameras with less dynamic range might benefit from higher exposure (or a brighter target) as long as the red-green and blue channels track well. One advantage to setting white-balance in the middle of the exposure range, is that if the channels don't track well, there's a better chance that subjects with average brightness (like people's faces) will come out the right color. I moved this to the Technique forum because it looks like a better fit. I do the same thing when I shoot events -- there's just no time for shooting reference shots. When I'm at my best, I use a shoot-through white-balance filter occasionaly as I go, and then use those images (instead of shirt-collars) to batch correct. It's all good because the receptions (and most weddings) happen under tunsten light. Clients and guests will remember the light as being a bit on the warm side. Besides, the cotton shirts gives a good start and if I don't like it, I can fine tune it a bit. What you call a Lastolite disk I purchased under the name BalanceSmarter, but they sure look the same. I even included the pure white target from Babalcolor that Andrew Rodney felt was the very best. It is the small 1 in white circular target at the left of my first image. I have watched the ACR videos of M Reichman and J Schewe, and Jeffe does suggest using the second white target on a MacBeth color checker, and if I have one in the field that is what I would do, but I never use on in the field. The thing I like about the Lastolite/Balance smarter, is that when shot in Av mode, it will not only give you a white balance image, it will also give your a very precise exposure setting ( aperture and selected shutter speed ) and verify that the exposure is correct by having a thin spike in the very center of your histogram for each of the three channels - R,G,B. It is interesting that a gray paint sample is so accurate though. I may look into that particular grey paint mysef. I mean the actual paint. I read a natural light portraiture book...can't remember the name...where the author suggested having a nuetral grey cube shaped block of wood mounted to a short stick. The function of it was to assertain the direction of natural light by rotating so the light struck it on a broad side. By having the side pointed at the light painted darker he would simply look for the shades of grey to match to get a 1:3 ratio. And there is where he would place his subjects...with the direction of the light at 45 degrees and with a nice fall off of a 1:3 ratio. Ive probably bungled the description of the thing...but at the time I read it I thought it to be a nifty neat and simple tool for finding sweet light. ... I read a natural light portraiture book...can't remember the name...where the author suggested having a nuetral grey cube shaped block of wood mounted to a short stick. The function of it was to assertain the direction of natural light by rotating so the light struck it on a broad side. By having the side pointed at the light painted darker he would simply look for the shades of grey to match to get a 1:3 ratio. And there is where he would place his subjects...with the direction of the light at 45 degrees and with a nice fall off of a 1:3 ratio. I know that some movie studios use a gray sphere to record the quality and direction of light in a scene so that they can duplicate the lighting for matching animation. Yup.....thats what I was talking about...though those examples seem on a larger scale than what I had seen. Thanks for the comments, and no worries, it all seems "on-topic" to me. Pathfinder -- interesting that there seemed to be a product name change, but I think it's the same thing. In fact, I'm not really sure what mine was called when I bought it -- I went to Lastolite to see what they're calling them now. Jeff -- Happy Holiday's to you too! I was re-reading your other post about the 1:3 ratio cube target too. I'm not aware of anything like that, but it's an iteresting idea. Unfortunately, the "standard" colors on the Glidden paint strip don't have that ratio, but getting it mixed custom probably wouldn't be hard. I think the cube was to be a neutral gray, and then you meter off of each of the sides ( with a reflected spot meter ) to ascertain the lighting ratio. That was how I understood it anyway. I see that this is a bit of an old post, I was wondering what software you used to get a spot reading on the grey cards. I have an i1 pro spectro. but have no idea how to get an RGB one point reading. Thank You in advance for any clues you can give me. If you shoot a properly exposed frame of a grey card, either as a jpg, or a RAW file, you can read individual pixel data of the R,G,B channels with the eye dropper in Photoshop. If you are on a Mac, you can read the individual displayed pixel data on your screen of the displayed image, with the DigitalColor meter app that comes in OS X in the Dock. I do not know how to read individual pixel data in the camera directly, before the file is downloaded... You asked for a point reading and I am assuming your are discussing pixel data points, not a point reading with a light meter which is a slightly different topic. What we do know is that a tool that promotes itself as a reference for neutral gray, should read 128,128,128 in each of the three channels in RGB, or the a and b channel should both read 0 in the LAB color scheme. We can determine if this is actually true, by shooting a PROPERLY EXPOSED frame of the object, and then seeing if the pixels in the file truly are equal in each channel with Photoshop or other image editing software that reads individual pixel data. One of the important points is that the exposure must be quite accurate if a jpg is going to represent a mid point grey accurately as a mid tone in the histogram. One could use an incident light meter, or an old, but very useful exposure table from film years - the Sunny 16 rule. I used both techniques for exposure in the thread I linked, and they both agreed. And the grey card step charts displayed a full range of tones from black to white with the mid tone very near to 128,12, 128 so I believe my exposures were spot on. An improperly exposed jpg file, might display a true neutral grey as a white or a black tone, depending on whether it was over or under exposed. That is why I stated so strongly, that it must be a properly exposed jpg - a properly exposed neutral grey card should display only a vertical line in the midpoint of the histogram. This is actually what one gets with an expo disc or a large neutral, non specular grey card too. Chris, the original poster was reading data directly from his grey card samples without an intervening photograph, with his Gretag Macbeth i1 Spectrophotometer and I think with the software that came with it. I think it reads "spots" on the card, but not spots near as small as individual pixels in a digital copy of the grey card. Whether this is more or less accurate I am not certain, it does avoid the intervening of the camera profile, sensor accuracy et al. i1Match (old) so if you have a later OS, that's not going to run. There's PatchTool from BableColor which is very powerful and supports your instrument. You really want Lab or better, spectral color which is possible with your i1Pro and the right software. From there one could convert to RGB once an RGB color space is defined.